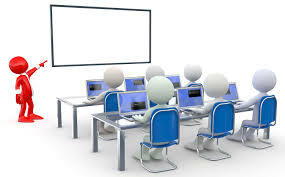 We are living in the 21st century so called as the modern century, as a member of this century we all have seen many technological developments in the field of Information and Technology. Development in the technology has lead to a more comfortable lifestyle but still there are many general problems which are not yet been solved. Problems involving accidents, municipal related issues and crimes are increasing at a higher rate. Everyday accidents occur causing one death every four minutes. Garbage, water problems, sanitation, power supply etc., municipal issues are a common site every day and crimes exist in various forms everywhere. But people don't readily come forward for reporting these issues due to the fear of revealing oneself. Therefore, we are proposing such a system that will help people to present their issues without any fear. Registering a complaint about a civic issue is now just an App away. The prime objective of the proposed system is to preserve the privacy of people while they are reporting for any of the problems which we discussed earlier. With smart phones becoming increasingly popular, citizens can now download any Android applications at any-time since they are cost efficient and easily available. Hence, we are developing an Android Application which is very helpful for the people to come forward and raise their voice against any issues(which are discussed above) they might be facing. Using our proposed Android Application people can lodge complaints and report incidents such as accidents. The techniques used in our system are Shamir's Secret Sharing Algorithm for encryption purpose to preserve identity of users, Google APIs for Location prediction so that when user reports any complaint it can be registered in the data set of specific location. Also location tracing is required for finding near-by hospitals in emergency cases like accidents. Citizens can not only make a complaint on several issues using the application but they can also upload photographs of the civic problem. After registering on the application the user can make complaints regarding garbage, cattle, potholes and street lights. User can also report incidents that are dedicated to social issues like lost items, events, local crime spotting etc. Now-a-days, mobile phones are becoming more and more popular. The general term used for today's mobile phones is "Smartphones". The use of smartphone has become very popular and even necessary in our daily routine. So, they began to cost less money and more people could afford them. The majority of mobile phones made after 2010 are smartphones. The high usability of smartphones is by consumers as well as the corporate and public sector. Due to the advance technology today's mobile phones have grown into technically and functionally hi-tech smartphones which have more in common with computers than with the old conventional phones. Mobile communication is one of the latest and the handiest way of transmitting the message to the intend receiver. of smartphones and their rich features have contributed a lot towards the development of smartphones. In smartphones we have different choices of operating system like some smartphone manufactures provide Windows OS, some provide iOS, some provide Android OS and there are many more new OS which are still evolving. But among all these, majority of World's population uses smartphones with Android OS, since they are easy to use and also affordable. Without any doubt the technology has changed the way we lead our lives and these changes are prominent over the last decade. There are several improvements in life due to the positive effects of technology and there are some negative impacts as well. Positive impacts would be that the technology has made our lives easier and full of luxury but on the other hand negative impacts like the laziness which is harnessing among us due to luxury and the ignorance of people in crucial situations lead to critical outcomes which affect everyone lives. So keeping these things in mind, by trying to implement good effects and avoiding bad effects, we are proposing a solution which is in the form of an Android App. Our Andro-Socio App plays an important role in reporting any of the social issues like municipality related problems, any criminal activities or accidents. 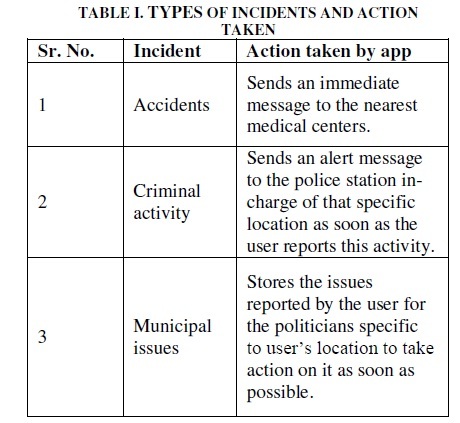 Andro-Socio App preserves the identity of the user who is reporting any of the above incidents. We use Shamir’s Secret Algorithm for encryption of the user’s information which helps in preserving the privacy of the user. Our App records any report submitted by the user systematically. This well maintained record is further used for making a rating scheme corresponding to the politicians based on User’s review. This rating will be very useful when voting for the Politician at the time of Elections. As we discussed in Table I, in all the incidents mentioned, location service and maps are a must. For which we use Google API’s. Out of many services provided in Google API, we integrate some of the main services like Google Maps and Google Maps distance matrix. In case of accidents and criminal activities, an immediate alert message is sent to the nearest medical centres or the police station, as per the location respectively. As for the municipal issues, the report is lodged in the database for the politician of that concerned area can take action on it. In our proposed system architecture the Key terms are Android Phones, PHP Servers, Web Servers and Database servers. Android Phones are used by the Users for sending signals or messages and reporting the incidents. 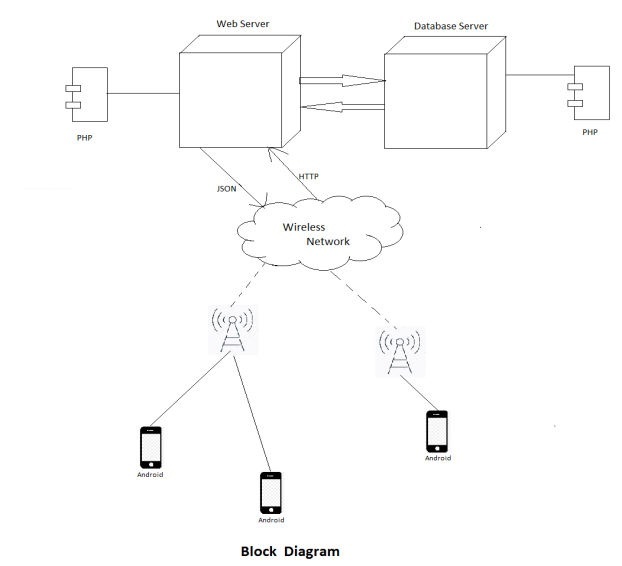 These signals/messages are transmitted through the wireless network to the Web Server. In wireless network, for transmission, we use HTTP while sending and JSON while receiving the signals/messages. The reports and the messages send by the users are stored in the Database Server. Also the registration information of the User is stored on the Database Server in Encrypted format. The overall management of the Web Server and Database server is done by PHP Server.  Knowledge of any k or more D pieces makes D easily computable.  Knowledge of any k -1 or fewer pieces leaves D completely undetermined (in the sense that all its possible values are equally likely).This scheme is called (k, n) threshold scheme. If k=n then all participants are required together to reconstruct the secret. Software is required for sending and receiving bulk messages and various software packages are available. These software packages provide users with the opportunity to add as many phone numbers as required and these phone numbers can be managed in a variety of ways. So we are providing this facility to the users after we acquire this software facility. In our app we are integrating Google API services for location tracing of nearest required medical center or police station. The Google Maps Distance Matrix API returns information based on the recommended route between start and end points, as calculated by the Google. The first screen which appears when we open the Andro-Socio App is the Splash Screen. The Splash Screen contains the User icon and Politician icon for Login and also at the bottom of the screen there is an option for registration for new users. Registration of local citizens and the politicians is distinct which is stored on the Database Server in encrypted format. Users can upload their pictures on their profile and they can change or update the information anytime. 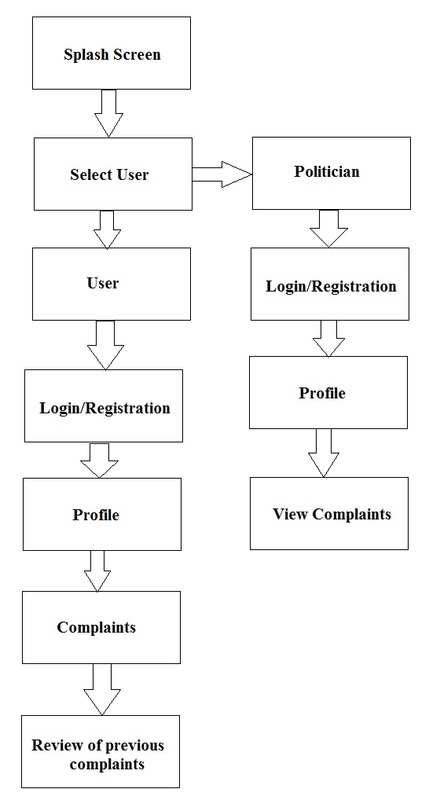 Users should Login to their respective accounts for reporting any kind of complaint or accidents. The Politicians can view these complaints and can take required actions as soon as possible. The proposed system facilitates privacy preserving of the people’s identity while they lodge complaints, report incidents like accidents, municipal related issues and crimes with the help of data encryption techniques. In our app there is login for two users i.e. Politician and Common people. In this app, citizens can not only make a complaint on several issues but also they can upload photographs of the civic problems. So far instant messaging facility is provided. It provides review scheme which can be used for polling purpose. Emergency calling facility is also provided for some critical situations. Xiaohui Liang, Rongxing Lu, Le Chen, Xiaodong Lin and Xuemin (Sherman) ShenPEC: A Privacy-Preserving Emergency Call Scheme for Mobile Healthcare Social Networks, 2011 JOURNAL OF COMMUNICATIONS AND NETWORKS, VOL.13, NO.2. Ahsan Mustafa, Atif Jan, Sahibzada Ali Mahmud, Zeeshan Sha_q, Gul Muhammad Khan, Muhammad Haseeb Zafar - Point-of Interests Based Best Path Selection Using Cluster-based Routing, 2014 IEEE. Andrea Saracino, Daniele Sgandurra - Addressing Privacy Issues in Location-based Collaborative and Distributed Environments, 2014 IEEE. Peter Teu, Andreas Fitzek, Daniel Hein, Alexander Marsalek, Alexander Oprisnik, Thomas Ze_erer - Android Encryption Systems.